Ever since we took the minis to an apple orchard last weekend (read more on that here: ) the daycare kids have been asking me to take them to an orchard too. Since I'm not too keen on taking 6+ kids to an apple orchard myself (and the fact that we don't have a vehicle large enough to hold everyone), I decided to set up a make-shift apple orchard in the backyard. We started by making baked cotton balls. 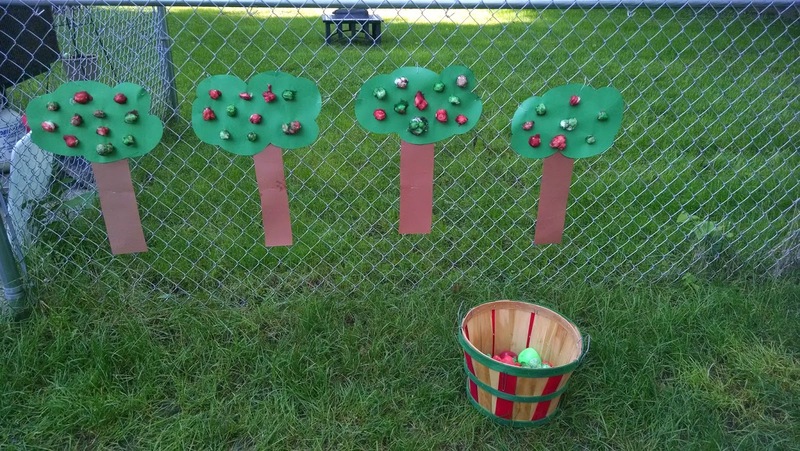 After searching stores and thinking what would work for the "apples" I found this site: http://onelittleproject.com/baked-cotton-balls/) Baked cotton balls worked great on the construction paper trees! I then cut out the tree shapes using 11x17 construction paper. I taped the tree trunks and green top together on the back. Once the cotton balls were baked and cooled, I glued them (a little too well it seems!) onto the paper trees. I let them dry over night. I used paper clips to attach the trees to the fence. Paper clips turned out not to be the best idea because the paper instantly ripped through as soon as the kids pulled the "apples" off. The kids got really creative with this as they "picked apples." The apples didn't come off of the trees easily at all, but I had a barrel of the cotton ball apples that they loved. They particularly loved stomping on the hard shell to break the cotton ball loose. I glued the "apples" on a little too well....the kids had quite the issues pulling them off! One of their favorite things: stomping on the apples to break the hard coating and then examining the inside (which remained the squishy cotton ball). Harrison grabbed his apple picker (something that goes on his soccer net) and Elizabeth came riding in on a tractor to give the kids tractor rides (something that the apple orchard we went to did). 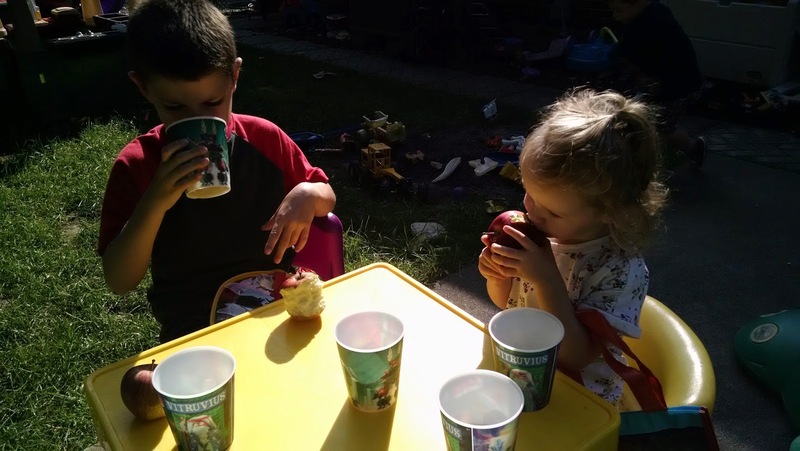 One of their favorite parts of our Apple Orchard was the apple cider and an apple they got to eat while they picked. The kids had fun with their apple orchard despite the apples being difficult to pick off of the trees and the trees ripping off the fence the minute they tried to pull the apples off (I was more frustrated than them about it). Clean up was easy and we still have plenty of "apples" left to play with for next week!